Featuring the World of Outlaw Late Model Series racing for $10,000 to win and the USRA Modifieds racing for $5,000 to win! FREE Grandstands courtesy of the Local County Corn Grower Associations and many local supporting businesses. The Deer Creek Double Down is a voluntary $50 entry fee from the driver to race for Double the normal pay. If driver elects to not double down they race for normal pay. Recognizing drivers from the past with pre-race activities. The IMCA Racing Series will return to Deer Creek Speedway on Tuesday August 6th, 2019 for the 28th Annual Harris Clash. Featuring the IMCA Modifieds racing for $3,000 and IMCA Sport Mods racing for $1,000 to win. Champions will be crowned on the 5 weekly Deer Creek Speedway divisions along with the 2 Button Buck Speedway divisions. 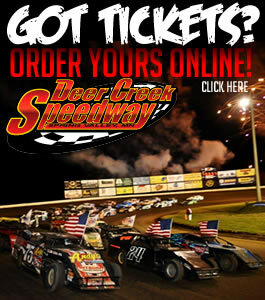 Featuring the USMTS Modifieds along with USRA Iron Man Stock Cars & B-Mods, and WISSOTA Street Stocks.